Are you looking for fun, but meaningful work to end the school year? I think this will help. This unit is appropriate at a grade 9 level (or if you have older grades with weaker students). This is a 10 to 13 period Poetry unit that contains ALL the necessary information for the teacher and for the students. 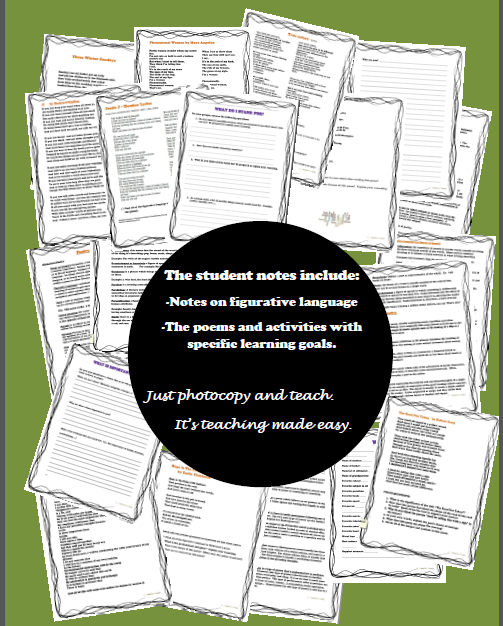 Detailed lesson plans with suggestions for discussion are available as well as a visually pleasing student guide. All that is needed from the teacher is to photocopy the pages for students and begin teaching and learning. - An end unit evaluation - in a Word document for easy modifications. (With detailed evaluation rubrics – one for the written component and one for the oral component - answer key and annotated teacher version included). - A detailed answer key is included. In the lesson plans, there is detailed information for each poem taught. This poetry bundle has been designed to use mostly with the intermediate student. are and what they stand for.